Swiss army knives are multi-purpose tools perfect for everyday basic needs. It’s probably a good idea to own one for easy access to your basic tool requirements. You’ll never know when you’ll need a knife or a pair of scissors. For the best Swiss Army knives, then Victorinox Explorer Swiss Army Knife comes highly recommended. It’s perfect for everyday use and on not so common needs. This model includes all the basic tools such as the knife blades, corkscrew, and can/bottle openers. Aside from that, it includes unusual equipment such as the multi-purpose hooks and the magnifying glass. The Explorer model has a total of 32 different tools, all made by world-class stainless steel. Since it is manufactured by Victorinox, the first producer of the Swiss Army knife, you can be assured that your Explorer Army Knife is made with high quality standards. The Victorinox Explorer Swiss Army Knife is the kind of multi-tool that can be a perfect gift for your loved ones or as a handy device for yourself. It’s practical and with various functions for everyday circumstances. 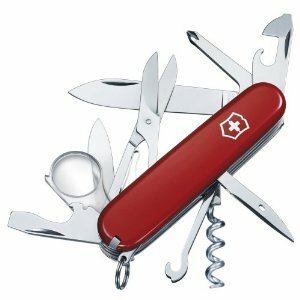 With the range of tools provided by the Explorer, it is probably one of the best Swiss Army Knife produced by Victorinox. You are sure to be guaranteed against defects because of its world-class workmanship. With these much gadgets compressed in this 91mm x 3 Â½ in tool, you may wonder if it’s long-lasting. 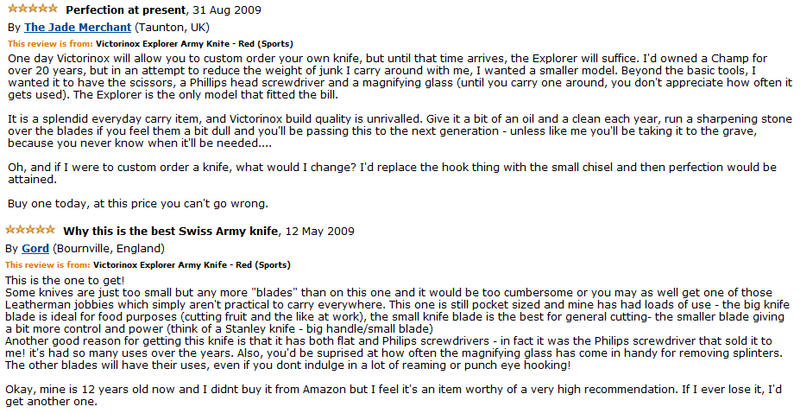 Be rest assured that Victorinox Explorer Army Knife is not some fancy accessory. This is a well made Swiss Army Knife guaranteed to last for a long time. Find more info on Amazon.